Summer is quickly approaching. Be prepared to cool off your dog with plenty of fresh cool water, and these creamy frozen "cupcakes". The classic flavor combination of peanut butter and banana come together in a new chilly way in these frozen dog treats. Since many dogs are sensitive to dairy, we've opted for a coconut milk yogurt in the recipe. If you can't find coconut yogurt, you can easily substitute it with another non-dairy yogurt like almond milk yogurt or soy yogurt. Whichever type of yogurt you use for this dog treat recipe, make sure that it is plain and does not contain any artificial sweeteners like aspartame or xylitol. The banana acts like a cupcake "crust" at the bottom of each cupcake. However, if your dog isn't fond of bananas, you can use another dog safe fruit. For example, thin slices of strawberry would be adorable in these frozen treats. You could also drop a couple whole blueberries into the treats before they're frozen for another flavor option. We used silicone baking cups for this recipe, but if you don't have these on hand, you can use a regular ice cube tray instead. Peel the bananas and slice into thin circles. 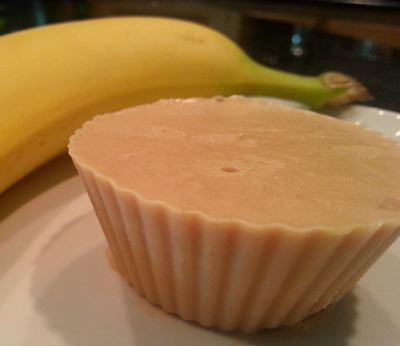 Place one banana slice into the bottom of each cup. 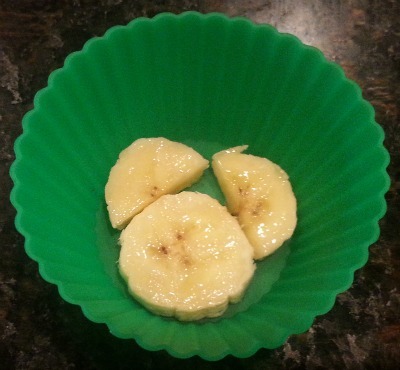 (Optional - Place two slices of banana into the bottom of each cup, like shown below). In a glass measuring cup combine the peanut butter and water. Microwave the peanut butter for 10 - 15 seconds to warm the peanut butter slightly. Once warmed, stir the peanut butter and water together until completely combined. Slowly pour the peanut butter mixture into each prepared cup. Place the filled cups on a baking sheet, or other flat surface. Freeze for 2 hours or until frozen solid. Remove the silicone baking cup and serve. If you aren't going to serve these immediately, you can place the treats in a labeled zip top freezer bag for up to 4 months. 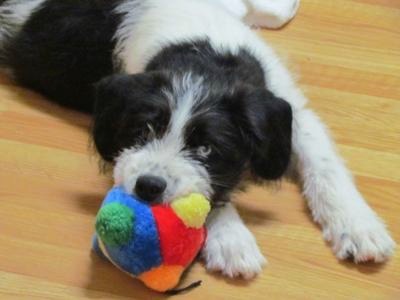 Our Featured Fan for the month of June is Lolo a Saint Pyrenees Mix. Apart from people food, Lolo's favorite treats so far are homemade - I have a recipe for gluten free peanut butter treats I got from my sister, which he loves (as do I), and he especially loves dehydrated sweet potatoes or yams. He will do pretty much anything for either of these treats. Did you enjoy the frozen dog treat recipe featured this month? There's one frozen dog treat recipe in the eBook that isn't featured on the website or any newsletter. Curious? Did you know that all of the recipes in the eBook aren't published on the website? Yes, you get 15 easy, original, fully photographed recipes to make. "Love your newsletter! Look forward to it each month! I just wanted to let you know my two Whippets love your recipes. I am recommending your website to anyone that asks. I have your website saved to my phone, so if dogs have special needs, I can accommodate them also. 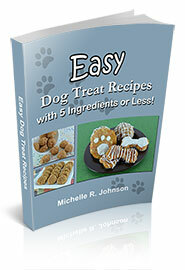 Your peanut butter dog biscuit and gingerbread cookie recipes are my dogs favorites."